Long delays at Transportation Security Administration checkpoints at major airports nationwide have been causing passengers to miss flights. The situation will likely get worse during summer, experts predict. JFK, according to Fox News Travel, has “by far” one of the worst TSA checkpoints. But security delays are not the TSA’s only problem. Newark Liberty International, which runs a close second to JFK on Fox News’ list of US airports with “the worst TSA checkpoints,” also was slammed for lax screening and reports of employee theft. That resulted in a rare occurrence in government: Several employees were actually dismissed. Not to be outdone, a screener at JFK last summer was likewise busted for theft, trying to abscond with a passenger’s Rolex watch. Another TSA security screener at JFK was arrested three weeks later on an unrelated theft charge. There is a ready solution to the TSA’s problems: Replace the agency. 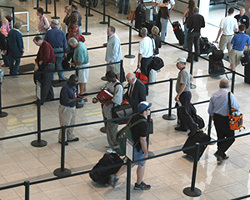 In large airports with multiple security checkpoints, airlines should be required to hire their own screeners and set their own procedures, bypassing the TSA. Competition among the airlines would help set the proper balance between safety and efficiency, based on passenger preference and demand. This same competitive process would also weed out unnecessary procedures that add little to safety while increasing delays. Posted: 5/2/16 at 9:15 AM under News Story.